The University of Hawaii Cooperative Extension Service (UHCES) is launching a campaign to promote local growers in the community and encourage healthy eating by holding a GET Local Video Cooking Competition. GET local stands for Grow, Eat, Think Local. All students who are 12 to 18 years old are invited to submit a cooking video that highlights their cooking abilities, uses a local ingredient for their recipe, and includes information on the local farmer. Molokai students who want to help their schools or communities go green now have a chance to earn funding to back their big ideas. Conservation and education nonprofit Kupu, in partnership with Kokua Hawaii Foundation, is launching its third annual Hawaii Youth Sustainability Challenge mini-grant program, which supports student-led environmental initiatives. Applications are now open and due Oct. 19. Students in grades 6-12 from public, private, and charter schools statewide are encouraged to apply. Sustʻaina ble Molokai’s Mobile Market began their “EBT Double Bucks Program” on Sept. 1! Does your family receive SNAP/EBT benefits? Are you interested in eating more fresh, healthy, local produce? Then you should check out Sustʻaina ble Molokai’s Mobile Market at sustainablemolokai.org/mobile-market/. The main goals of the program are to improve healthy food access and support local farmers. Buying local means that more food dollars stay in the local economy, which has a positive ripple effect for Molokai. 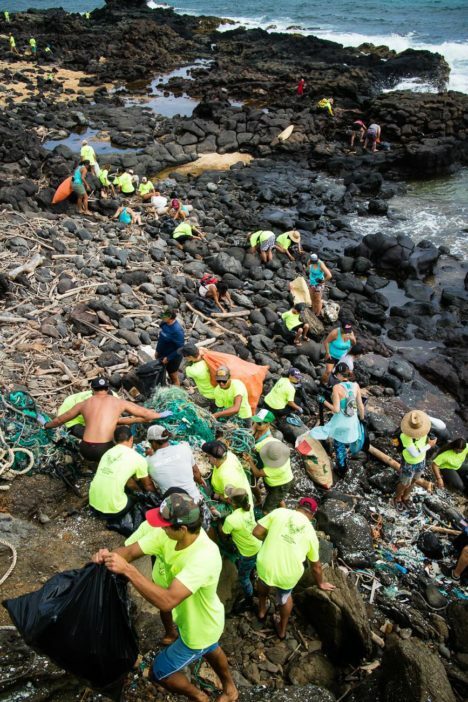 The fifth annual Mo’omomi Cleanup organized by Sustainable Coastlines Hawaii two weeks ago removed an estimated 30,000 pounds of debris from Molokai’s northwestern coast. More than 300 participants joined the effort, according to Kahi Pacarro, Sustainable Coastlines executive director. The previous week, Sustainable Coastlines visited classrooms and reached 678 students on the island sharing information about marine debris, plastic pollution and why it’s so important to take care of our oceans. 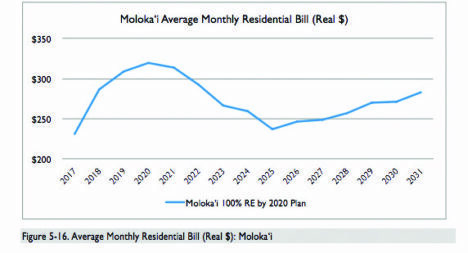 Hawaiian Electric Companies has rolled out a statewide plan that sets a goal for Molokai of 100 percent renewable energy by 2020. 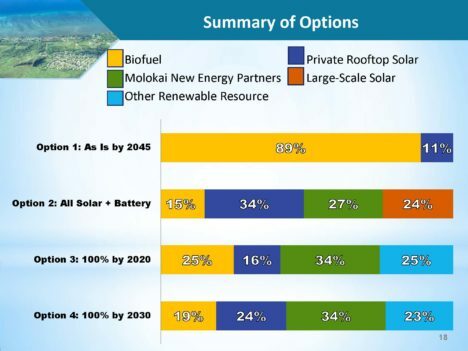 Over the next three years, the electric utility is proposing 1.4 megawatts (MW) of additional photovoltaic energy to be added to the island’s existing 2.3 MW of energy coming from rooftop solar panels, as well as 5 MW of wind energy. The plan also calls for a transition to biofuel for “some” of the island’s 12 MW of energy currently being generated from diesel fuel. With the recent submission of a Community-Based Subsistence Fishing Area (CBSFA) designation proposal for Mo`omomi and the North Coast of Molokai, and upcoming public scoping meetings, the Department of Land and Natural Resources (DLNR) would like to address some frequently asked questions. The proposed CBSFA extends from `Ilio Point in the west to Kaholaiki Bay in the east, from the shoreline out to one nautical mile. The `Aha Moku Advisory Committee (AMAC) has scheduled a series of public meetings this month to seek comment from communities in `ahupua`a districts as it develops and adopts rules for its operation and administration. Created by the Legislature in 2012 via Act 288, the `Aha Moku Advisory Committee is attached to the State Dept. of Land and Natural Resources (DLNR) and is mandated to bring the voices of the `ahupua`a communities forward to the Department on issues related to natural and cultural resources. 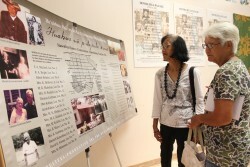 When homesteaders first took up residence on Molokai lands, they had to start from the ground up. Families worked hard together to put in roads and set up large wooden tanks to catch the rainwater for drinking and farming. They combined labor and resources to sow crops and purchase farming equipment. Ninety years later, Ho`olehua’s fertile lands are inhabited by their thriving descendants, who own homes, grow crops and use the infrastructure put in place by their ancestors.